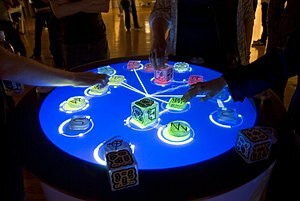 The user interface , in the industrial design field of human–machine interaction, is the space where interactions between humans and machines occur. The goal of this interaction is to allow effective operation and control of the machine from the human end, whilst the machine simultaneously feeds back information that aids the operators' decision-making process. Examples of this broad concept of user interfaces include the interactive aspects of computer operating systems, hand tools, heavy machinery operator controls, and process controls. The design considerations applicable when creating user interfaces are related to or involve such disciplines as ergonomics and psychology.